Caught in a lightning storm at sea, Robin's ship is destroyed by fire. She lands on an island and begins making preparations for life as a castaway. Top her surprise however, she finds an abandoned hut and a local island tribe. With their help, she hopes to rebuild a ship and find her way home. Join Robin in her amazing tale to get off the island. Play over 120 enchanting Match 3 levels in fun varieties including Swap, Collapse, and Find-the-Path to overcome the challenges that await her. Befriend the natives, find items to build the ship, and earn gold to call on help from powerful totems. Featuring Timed and Casual game modes, fun Hidden Object and Puzzle mini-games, and a host of wonderful achievements, this island adventure is sure to please you. 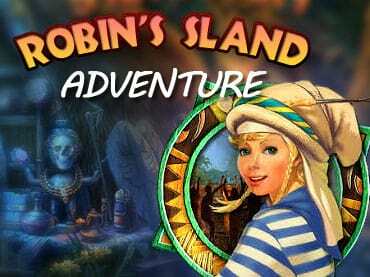 Download the full-unlimited version of Robin's Island Adventure today! - Play Hidden Object, Puzzle, and more mini-games. If you have questions about Robin’s Island Adventure game, please contact us using this form.